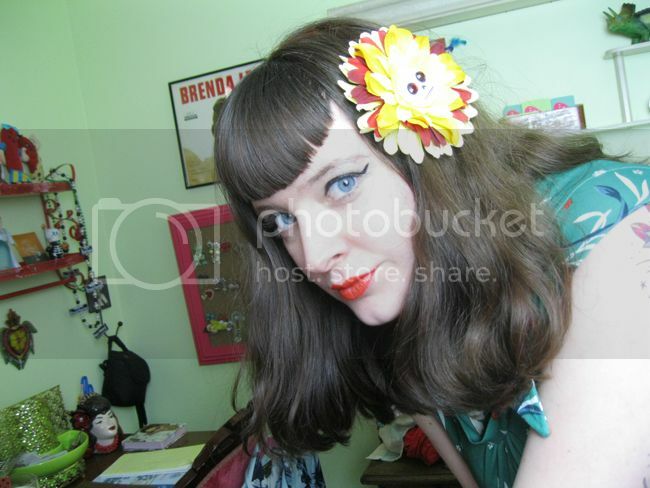 Betties N Brimstone: Vintage Shopping: Where to start?! Finding vintage is fairly easy if you know where to look! This post is designated to help you find what you’re looking for a little more easily. Start Small! When you're looking to expand your wardrobe with vintage, start with some truly classic pieces and work your way up! Maybe look into a black 50s pencil skirt or a white 70s peasant blouse. Try them out at the office or on a weekend outing and see if you like how they look. You can find vintage in many different places, it all depends on how much effort you want to put into finding it and your budget. First, we must assess how you like to shop! Which one do you identify with the most? I’m a Vintage Store Vixen! You know what you want and you don’t want to spend a lot of time trying to find it. The best option for you is to check out your local vintage or antique store. Vintage store arrange clothing a number of ways. From S, M, L to decade you can easily select items you would like to try on and you can be in and out in no time. If you dig online shopping, Etsy could be an easy way for you to find what you’re looking for. Shipping is usually pretty prompt depending on what country you or the seller lives in. Check out any vintage store in your area. To find the closest vintage store to you can always Google to find the nearest store OR check out this stellar US Vintage Directory. It’s organized by state. I’m A Cyber Chic Chick! You love the ease of buying with one click of the mouse and the anticipation of waiting to receive your new items in the mail. It’s like Christmas every time you check your mailbox! OR maybe you just hate crowds and fussing with long checkout lines…Whatever the case, online shopping may be your favorite mode of finding fantastic fashions! You want to learn all you can about vintage clothing. Maybe you have an interest in history or you work in the fashion industry. Maybe you are just looking for a new hobby…whatever the case; you love the thrill of the hunt. Thrifting: You will need to do a little bit of research on vintage before you go sifting through thrift stores, but they are definitely the best place to find vintage clothing at cheap prices. Check out your local Salvation Army or Goodwill. OH! And make sure you check out your local thrift stores. Estate Sales: Just make sure you get there early! Etsy: it’s really easy to find cheap vintage on Etsy, but it will take some searching know-how to find what you want! Garage/Rummage Sales – You can find some killer stuff and garage sales.